Anjum Rajabali, who is considered one of India's premier screenwriters and is the head of the screenwriting department at Whistling Woods in Mumbai, India (which the Hollywood Reporter named one of ‘The best film schools in the world’), has known businessman and social activist, Satinder Dhillon, for many years and is a close personal friend of his. The two have been discussing writing a movie about his life for some time now. After a recent meeting in Mumbai, at Whistling Woods, a few weeks ago, Rajabali and Dhillon intend to work together in the coming months, to take an 18 plus year battle, that is well documented in court files, transcripts and sworn affidavits and make a screenplay out of it. This screenplay is expected to eventually star an A-list Bollywood actor. "Satinder's life reads like an adventure. The struggle that he has gone through in this case lends itself to a very dramatic and thrilling story" stated Rajabali, when asked about why he was taking on this project. Rajabali, earlier this year, finished the script about the first Indian in space. Aamir Khan and Priyanka Chopra will be starring in the movie. (http://bollyworm.com/breaking-news/breaking-news-priyanka-chopra-star-opposite-aamir-khan/). Having worked with a number of India’s best known directors and actors, including the legendary Amitabh Bachchan, Rajabali heads the screenwriting programs at both of India’s major film schools - the official Film and Television Institute of India and the aforementioned Whistling Woods International, which was founded by Bollywood producer/director Subhash Ghai. An activist himself, Anjum Rajabali, has previously written scripts such as Ghulam for Aamir Khan, Aarakshan for Amitabh Bachchan and Saif Ali Khan, Ranjneeti for Ranbi Kapoor and Katrina Kaif and The Legend of Bhagat Singh for Ajay Devgn, Pukar for Anil Kapoor and Madhuri Dixit (https://en.wikipedia.org/wiki/Anjum_Rajabali). Other global entrants in the book include, top ten Forbes list earning actor - Akshay Kumar, President and CEO of Mastercard – Ajay Singh Banga, current Chief Minister of Punjab Captain Amarinder Singh, Air Chief Marshal – Birender Singh Dhanoa, Surender Singh Kandhari (Chairman of International Conglomorate Al Dobowi and Chairman of Guru Nanak Darbar Gurudwara in Dubai), President of World Punjabi Organization Padma Shri Vikramjit Singh Sahney, Dr. Narinder Kapany (the 'Father of Fiber Optics'), former Governor of South Carolina and current Ambassador to the United Nations for America Dr. Nimrata ‘Nikki’ Haley, famous Punjabi farmer known as the ‘Peach King’ Sardar Didar Singh Bains, Senior Dentist and Chairman of Sharing, Caring & Service Foundation Dr. Amarjit Singh Marwah, President and CEO of PTC Network - Rajiee M. Shinde, Founder of The Loomba Group of Companies - Right Honourable Lord Raj Loomba, CBE. Other Canadians in the book include, former Attorney General and Court of Appeal Judge in Vancouver, B.C. – Wally Oppal, Canada's current Minister of Defence – Harjit Singh Sajjan, lumber tycoon - Dr. Asa Singh Johal, International Businessman and Canada's first Sikh Billionaire - Erwin Singh Braich, property developer - Daljit Singh Thind, Chiropractor and politician - Dr. Ruby Dhalla, and 31 year old Arjan Singh Bhullar (the youngest entrant in the book) - who is the first South Asian in the UFC, the first South Asian to represent Canada in the Olympics and a Commonwealth Gold Medal winner for freestyle wrestling. 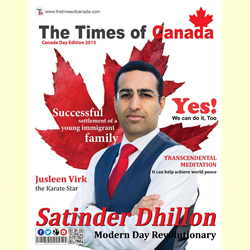 Dhillon was in his early twenties when the world's fourth largest accounting firm, KPMG, first entered into his life, after they were appointed receiver in the botched and involuntary bankruptcy proceedings of Canada's first Sikh Billionaire, Erwin Singh Braich (https://satinderdhillonkpmg.wordpress.com/). These proceedings are the longest of their kind in the history of Canada. These are the longest proceedings of their kind in Canadian history having lasted over 18 years and counting now. Mistry is a member of the Mumbai Bar Association and a member of the Canadian Bar Association. He is a very accomplished lawyer and has the most Amicus Curiae (judicial appointments) in the Bombay High Court. He is also the former President of the Entertainment Lawyers Association in India and has represented many high profile celebrity clients. His clients also include The Reserve Bank of India and Brihanmumbai Electric Supply and Transport Undertaking. Mistry was also the legal consultant, in Canada, to the Times of India Film Awards (TOIFA), that took place in Vancouver in April 2013, in which the B.C. Provincial government invested $11 million to host the extravaganza (https://beta.theglobeandmail.com/arts/film/bc-government-invests-11-million-to-host-times-of-india-film-awards/article7645090/?ref=http://www.theglobeandmail.com&reqid=%257B%257Brequest_id%257D%257D). World renowned lawyer, from England, Mr. Mark Stephens (who has represented Julian Assange among others) was also part of Dhillon’s international legal advisory team during his trial in Canada (https://en.wikipedia.org/wiki/Mark_Stephens_(solicitor). They also consulted together on the aforementioned Brexit vote aftermath. During his trial in Canada, Dhillon even received advice from one of Nelson Mandela's former lawyers – Mr. Martin Garbus of the U.S. who is widely regarded as one of the greatest trial attorneys to have ever lived and whom Time magazine called “legendary”. His client list includes Eminem, Al Pacino, Sean Connery, Robert Redford, Spike Lee, Martin Lawrence, Nobel Prize winners and political dissidents such as Vaclav Havel and many more (https://en.wikipedia.org/wiki/Martin_Garbus). “While I was in Mumbai this last time, I was asked to stay longer but couldn’t, as I had to return to Canada, due to the fact that I was involved with helping my close friend, Arjan Singh Bhullar, with the launch of his career into the UFC.” (http://www.prweb.com/releases/2017/05/prweb14348979.htm). "Working with Satinder is about more than just a file for a client. It’s the legacy of his parents and his own life's work that cannot ever be destroyed, now that it's gotten to the stage whereby people like Anjum and myself are involved. The story will be told no matter what. Once it's made into a film, then it will live forever” stated Mistry. “I’m so grateful to have the support of so many different people, from so many different walks of life, from so many countries” stated Satinder when asked about how he was able to able to connect with so many people around the world. "Without the advent of Facebook and the internet, I may well have been one of the muzzled voices in this world, as happens so often". “I still remember clearly when I met Satinder for the first time, a few years ago, in Mumbai, after I was introduced to him by our mutual friend Jamshed Mistry. Satinder was still fighting the trial at that point and had a lot of fight left yet to fight ahead of him" stated Gayathiri Guliani. He is also runs an international trading house and has offices in Guangzhou, China, Calgary, Alberta and Oliver, British Columbia. “Every human is born with a voice to express and is the reflection of the environment which he or she lives in. Being a part of the human race we can collectively do better if we keep grounded and understand the complexity of life and the situations that arise from the current paradigm we live in." “My father works for the Indian government, in Prime Minister Modi's office and since I was born he has explained to me the importance of an inclusive society. Meeting Satinder when he was in Delhi recently and having him come and visit my family while he was here, we all realized how much we all have in common, even though we grew up a world away from one another". "My father and Satinder literally had almost the exact same types of pictures up on Facebook with their mothers and my grandma and Satinder’s grandma have similar traits. It’s awesome that in today’s world, technology has brought us all much closer in a lot of ways and that is one of the great benefits of the technological revolution that has occurred in the world. It's amazing to see two people from very different generations using Facebook in similar ways" added Dhyani. “I’m fortunate I have lived to tell the story, it’s the ones suffering right at this moment still that need our help and I thank God that I met Anjum and Jamshed when I did and that they are willing to assist in writing about it all now, so that I can focus on other things. There are many other projects they could be doing and it's humbling that they would spend time and energy on this story over others." "What the system did to this young man’s life and the way he valiantly fought back is the stuff of legend now, back home in India and around the world and I’m very proud of him for what he did and how he maintained his sense of honour and sense of humor actually most of all." "On his recent trip to Delhi and Mumbai it was great to see him in such high spirits, after having braved some dark days that’s for sure. When he was here we spoke at length about his new projects that he is involved with, in New York and around the world and how he’s finally getting back on his feet after having been decimated by the powers that be in Canada, after having fought an 18 plus year battle against the system over there.” concluded Mistry. "I've never seen something like this happen in Canada in recent memory. I have gone to the courthouse in Vancouver and listened to the audio recordings from the court hearings and I literally couldn't believe my ears when I heard what the judge was saying. How can a person not be allowed to use the truth in a court of law in Canada? And then have to go to jail for posting truthful blogs? Why?" "I'm very proud of my friend for fighting back and not backing down. even after they arrested him and told him not to be like Malcolm X and Gandhi. What KPMG and the government did together is unprecedented in Canada. Where is the oversight? Whose watching over things like this to make sure corporations don't run over citizens like this? questioned Gurtaj "Goldy" Singh Dhaliwal a realtor who works at Century 21 Coastal Realty in Surrey and is a good friend of Dhillon's. B.C. man jailed for refusing to halt blog - Freedom of Speech Dead in Canada?